Vancouver, BC - Skyharbour Resources Ltd. (TSX-V: SYH) (OTC Grey: SYHBF) (Frankfurt: SC1N) (the “Company”) is pleased to announce the commencement of its winter exploration program at the Preston Uranium Property being explored by the Western Athabasca Syndicate (the “Syndicate”). 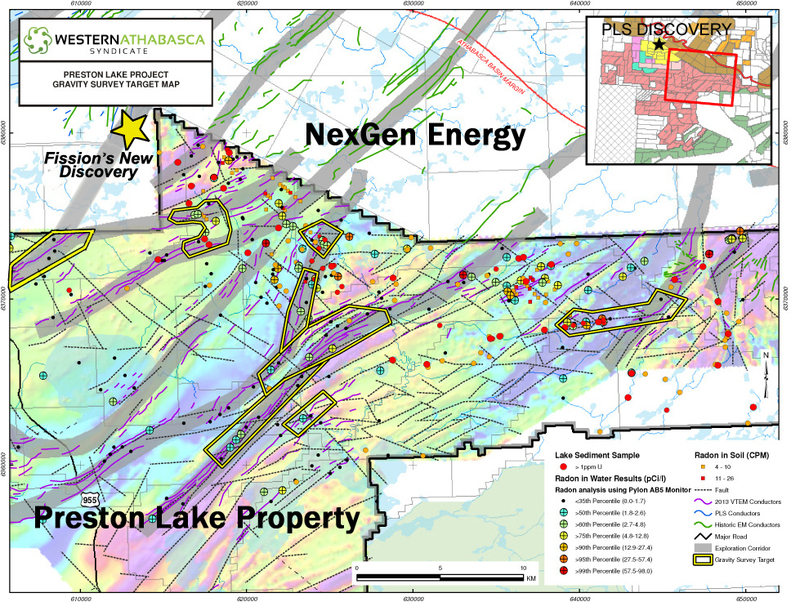 The Preston Property is strategically located proximal to Fission Uranium’s shallow, high grade Triple R deposit as well as NexGen Energy’s Arrow discovery in the Patterson Lake region in Northwestern Saskatchewan. The winter field program has commenced with a 1,200 station ground-based gravity survey over three targets in the Depper Lake area including the FIN, FSA and Dixon targets. MWH Geo-Surveys Ltd. has been commissioned to complete the survey. The targets are located within five kilometres south and east of NexGen's Fury target area as well as Fission’s Far East Zone where anomalous radioactivity was discovered in drill hole PLS14-255 in August of 2014. NexGen is exploring gravity anomalies on the Fury target that are coincident with conductors which trend onto the Syndicate’s Preston Property from the north. Combined results of the 2014 and 2015 gravity surveys will be used to prioritize and refine targets for additional 2015 surveys as well as drilling. The eastern targets (FSA, Canoe, and Swoosh) have already been identified as high priority targets based on 2014 exploration work and will be subject to additional RadonEx and ground based electromagnetic surveys in March-April of this year. The RadonEx survey will commence by the second week of March and focus on target evaluation and refinement at the FSA, Swoosh, FIN and Canoe targets. A previous RadonEx survey commissioned by the Syndicate in 2014 returned strongly anomalous radon results of up to 139 pCi/L (RIW) associated with coincident electromagnetic, magnetic and gravity geophysical anomalies at the Canoe target. An important component of the 2015 RadonEx survey will be to infill and refine future drill locations at this highly prospective target. The Syndicate has carried out one of the largest regional exploration programs in the relatively underexplored south-western side of the Athabasca Basin over the last eighteen months. A total of approx. $3.75 million in expenditures on the Preston Uranium Property has been incurred including ground gravity, airborne and ground EM and magnetics, radon, soil, silt, biogeochem, lake sediment, and geological mapping surveys, as well as boulder prospecting and a first pass diamond drill program. Fifteen high-priority drill target areas associated with eight prospective exploration corridors have been successfully delineated through this methodical, multi-phased exploration initiative which has culminated in an extensive, proprietary geological database for the project area. Skyharbour is the operator of the Western Athabasca Syndicate. Skyharbour is preparing for a winter drill program at its 100% owned Falcon Point (previously Way Lake) Uranium Project which will commence in March. This will be the Company’s first work program at Falcon Point since acquiring the project from Denison in the summer of 2014. 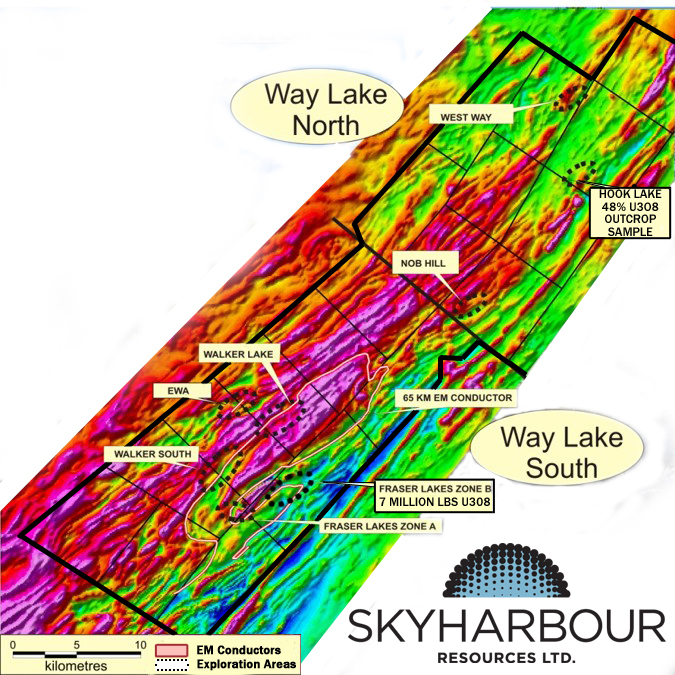 Skyharbour has received a recommendations report for additional work and drilling on the project from its geological team and drill permitting is underway. The program will consist of diamond drilling high-priority targets including areas in and around the current uranium resource at the JNR Fraser Lakes target. Additional details for the program are forthcoming. 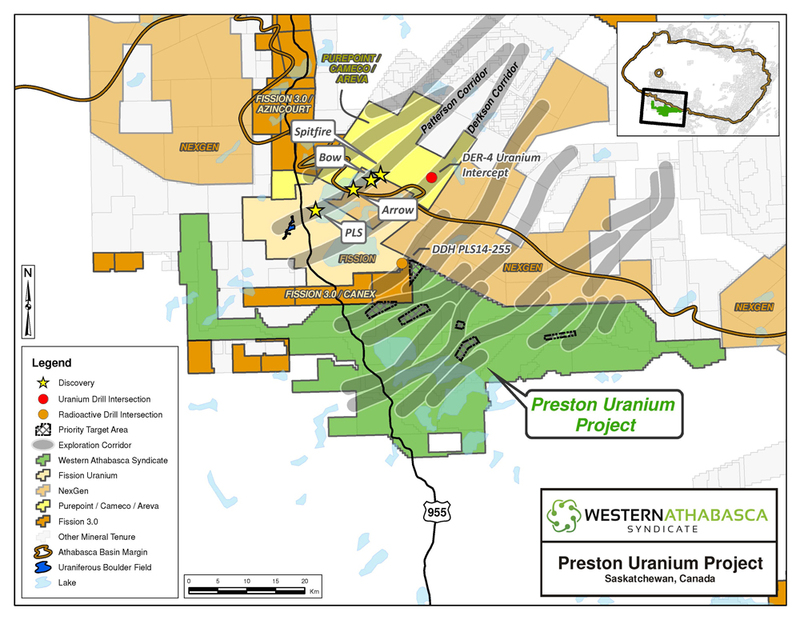 Skyharbour Resources Ltd. is a uranium exploration company and the operator of the Western Athabasca Syndicate which controls a large, geologically prospective land package consisting of five properties in the Athabasca Basin of Saskatchewan. Skyharbour also owns a 100% interest in the Falcon Point (formerly Way Lake) Uranium Project on the east side of the Basin which hosts an NI 43-101 compliant inferred resource totaling 7.0 million pounds of U3O8 at 0.03% and 5.3 million pounds of ThO2 at 0.023%. The Company owns a 60% interest in the Mann Lake Uranium project on the east side of the Basin strategically located 25 km southwest of Cameco’s McArthur River Mine. Skyharbour’s goal is to maximize shareholder value through new mineral discoveries, committed long-term partnerships, and the advancement of exploration projects in geopolitically favourable jurisdictions.